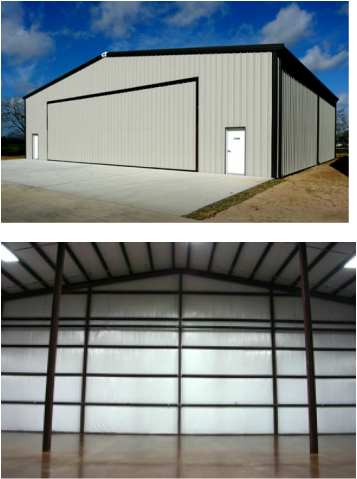 A hangar is a closed structure to hold aircraft in protective storage. Most hangars are built of metal with a steel frame, but other materials such as wood are also used. Hangars are used for protection from weather, protection from direct sunlight, maintenance, repair, manufacture, assembly and storage of aircraft on airfields, aircraft carriers. Hangars need special structures to be built. The width of the doors has to be large, and this enables the aircraft entrance. The bigger the aircraft, the more complex structure is needed.